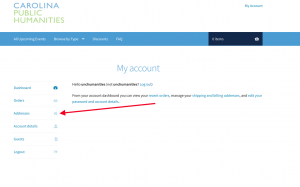 Some users have been experiencing a spinning wheel when trying to checkout. We’re aware of this problem and we’re working with the developers to resolve it. 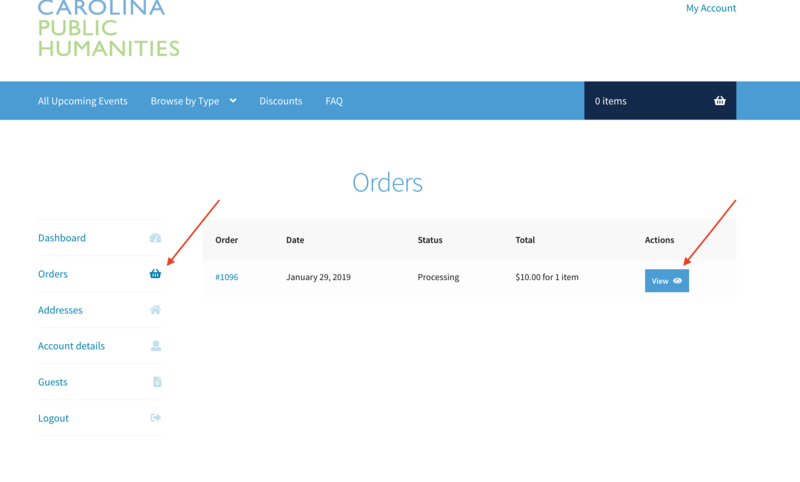 Some users have reported that refreshing the page after a minute or two allowed their orders to proceed to the credit card processing site. We apologize for any inconvenience. 2. 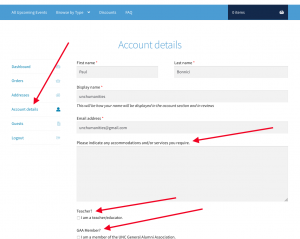 Create a secure password that you’ll remember. 6. 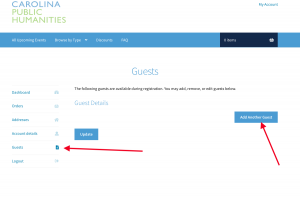 If you would like to add a guest (such as a spouse, partner, or friend) to your account, click “Guests” on the left hand menu. 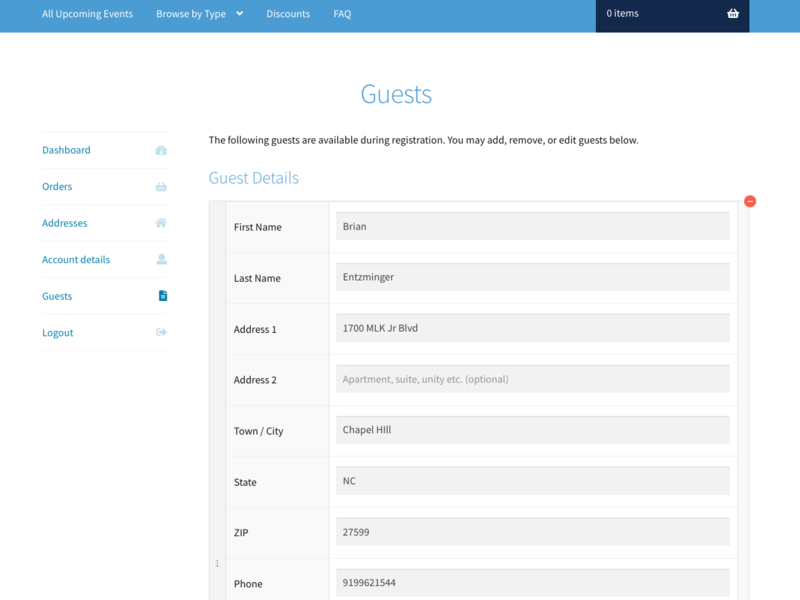 Next, click “Add Another Guest” to bring up a new form. 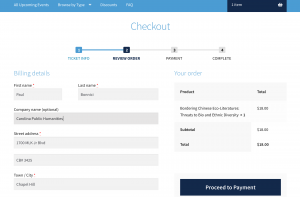 Complete all the required information and hit “update.” That person will now be linked to your account and you can choose them as a ticket holder during checkout. 7. 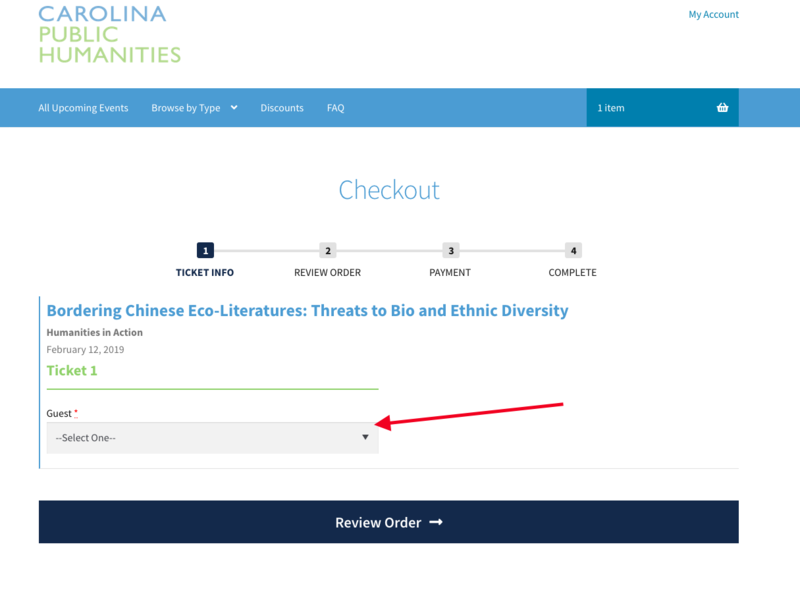 Once you’ve set up all your account information, click the Carolina Public Humanities logo in the upper left hand corner of the page to return to the shopping cart. 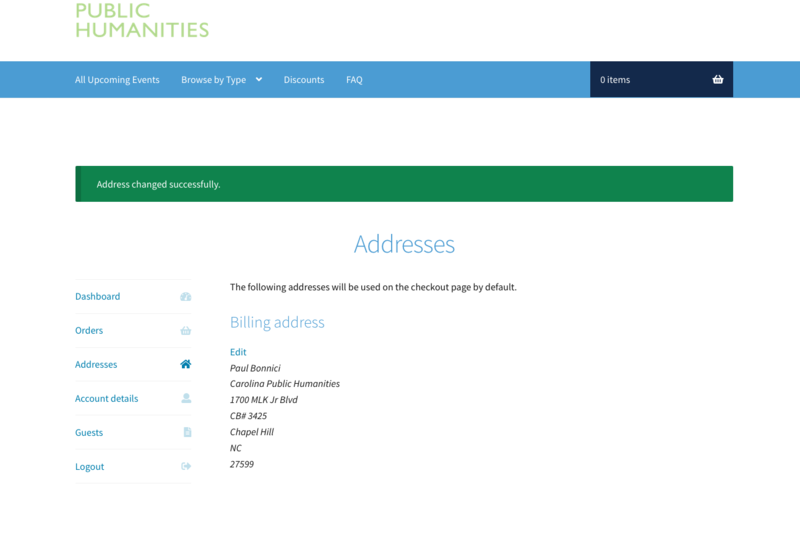 Click the “Browse by Type” button in the top menu to access the list of our programs. 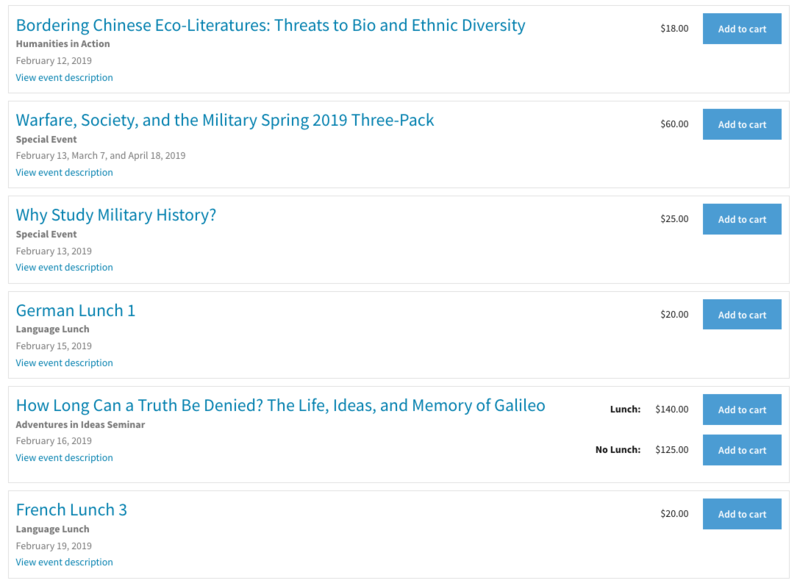 Click the program type you’re interested in to bring up a list of just those programs. Find the event(s) you would like to register for. 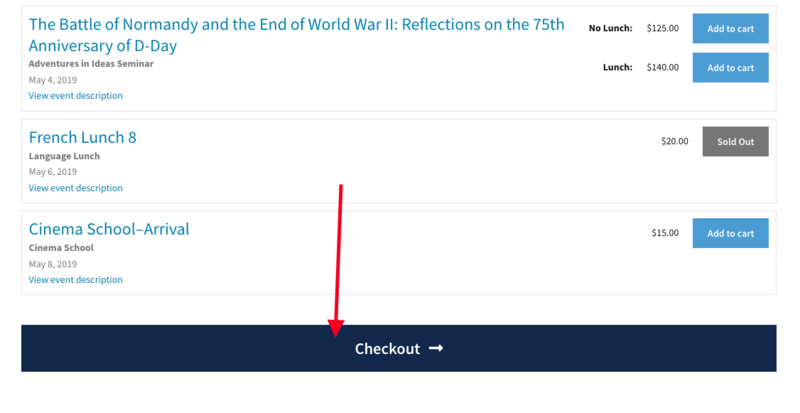 Click the “Add to Cart” button to the right of the event title. This selects one seat for you. 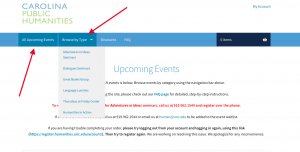 If you would like to add more seats, click the + on the right hand side of the button. 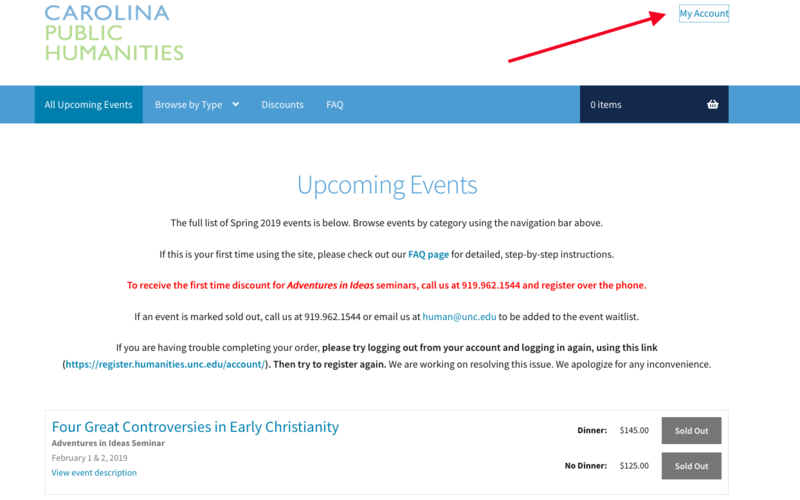 If an event is marked “Sold Out” call us at 919.962.1544 or email us at human@unc.edu to be added to the event waitlist. Certain events offer an optional meal. 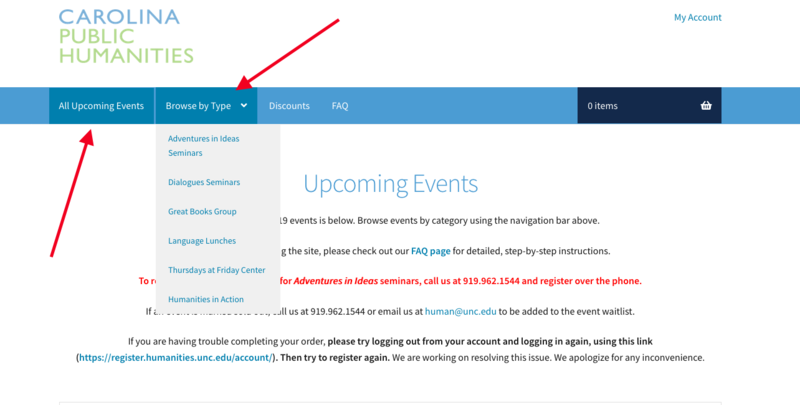 If you would like to forgo the optional meal, click the “no lunch” or “no dinner” button. 10. 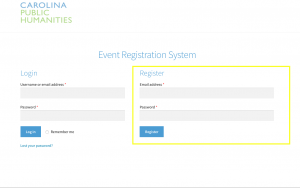 Once you have selected all the events you would like to register for, click the “Checkout” button in the top menu or the bottom of the page. 11. 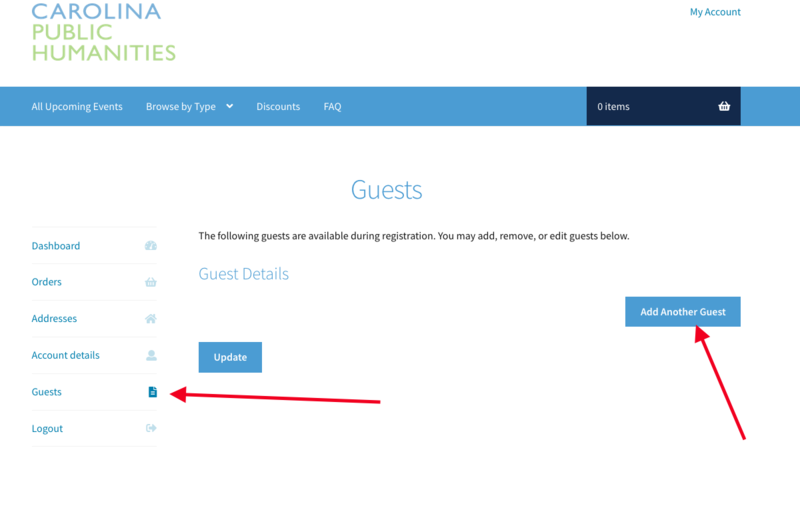 Under each event, click the drop down box under “Guest.” If your account is already setup, select your name and/or your guest’s name for each event listed to autocomplete your information in the form. 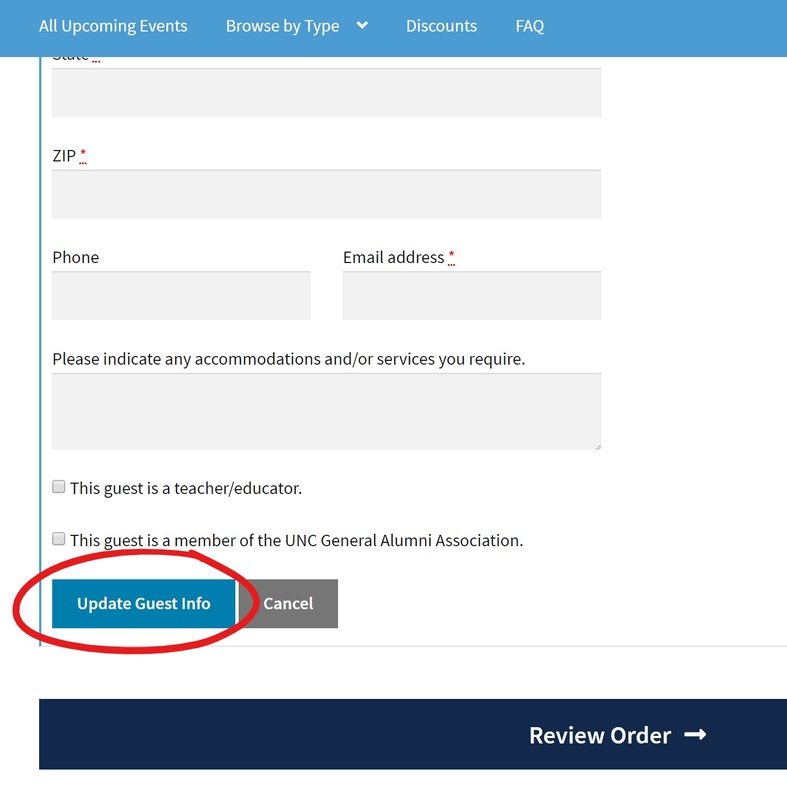 Click “review order” when you have finished assigning a person to each event ticket. 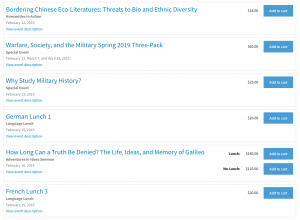 11a. 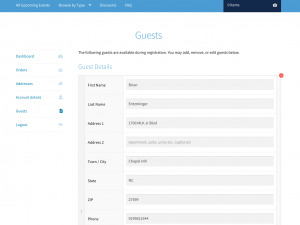 If you did not setup your account or would like to add a new guest, click “new guest” to bring up new fields. You must complete all the boxes with a red star. The ones without a red star are optional. 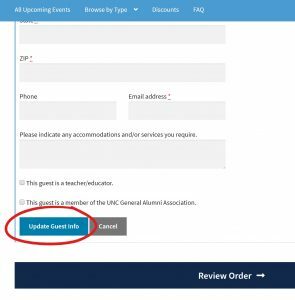 Once you have completed the form, click “Update Guest Info.” For each subsequent event, click the drop down box and your name or your guest’s name should appear. Click “review order” when you have finished assigning a person to each event ticket. 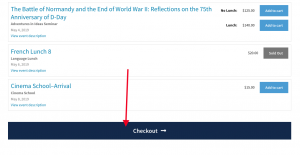 12. Review your order to make sure your discounts (see below) have been applied. 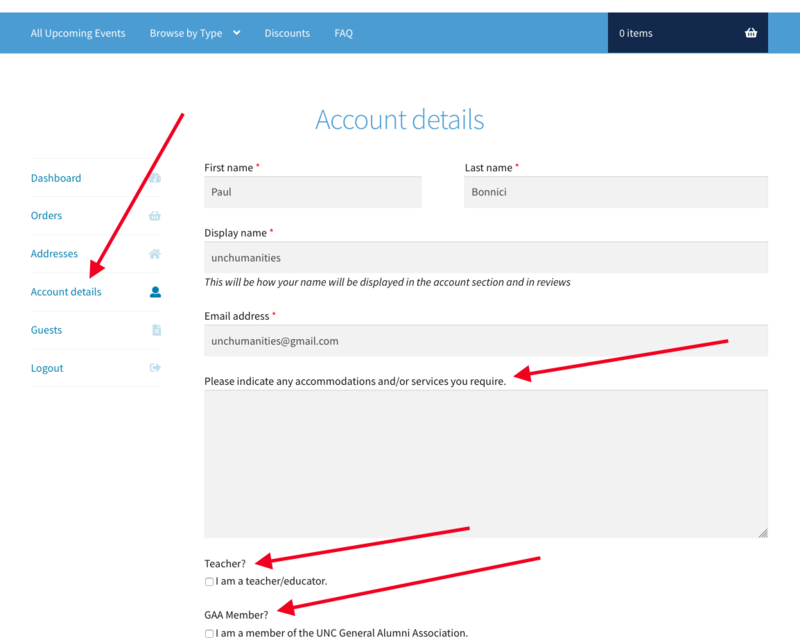 If everything looks good, click the proceed to payment button to take you to an external, secure credit card processing site. Events that are eligible for discounts will have those options listed below the ticket. Select the appropriate discount and complete the information requested for the discount to be applied at checkout. 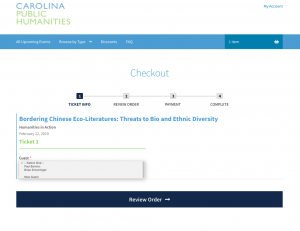 Please note that the first time discount and the UNC/Faculty Staff discounts are not eligible online. To receive those, call us at 919.962.1544 to register. 13. 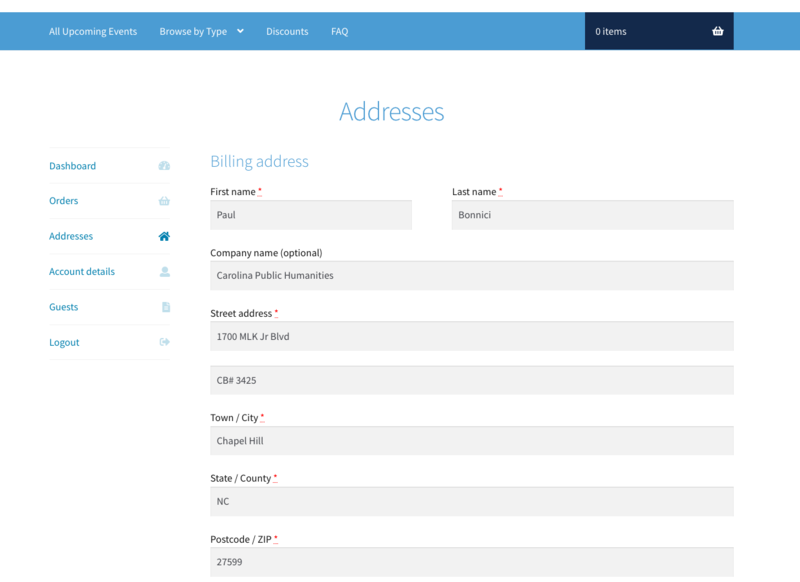 Enter your credit card information into UNC’s secure TouchNet site. 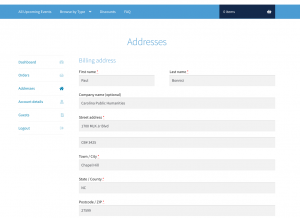 All of your billing information should already be entered into the credit card payment form. 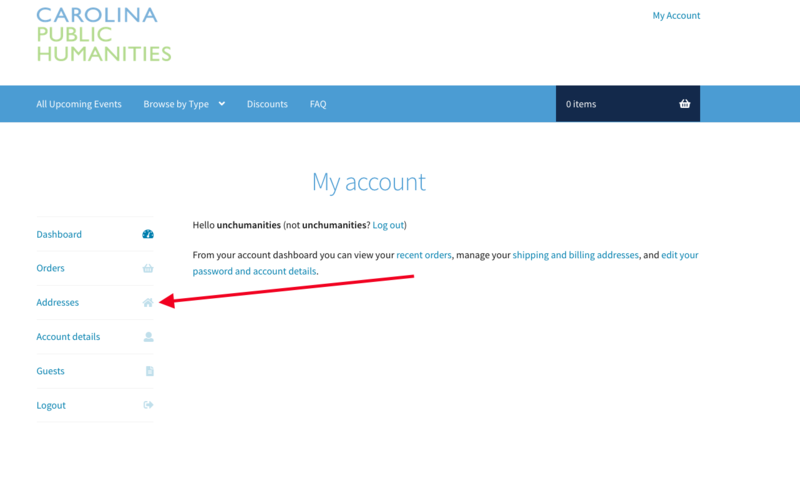 Once you have entered your credit card information, click “continue” to process the order. You should receive a “Notification of Payment” email from lerch@unc.edu once your order has been processed. 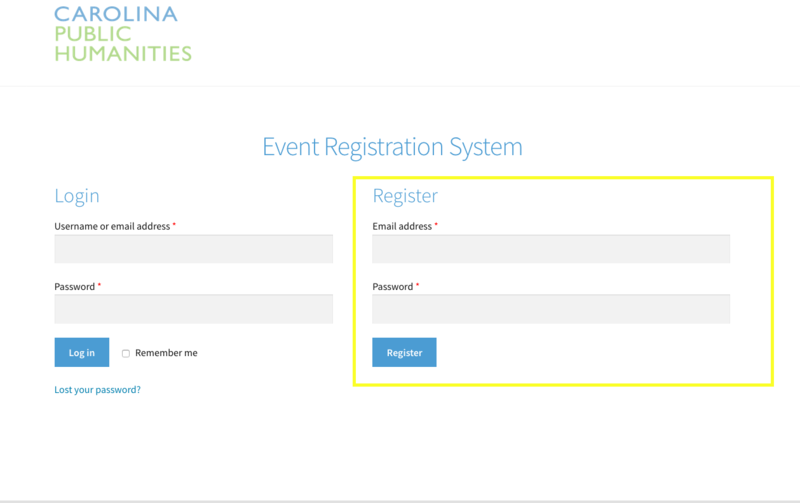 To check what events your registered for, click the “Account” button in the upper right hand side of the page. 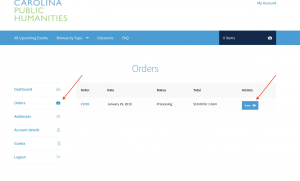 Click “orders” to bring up a list of your orders. 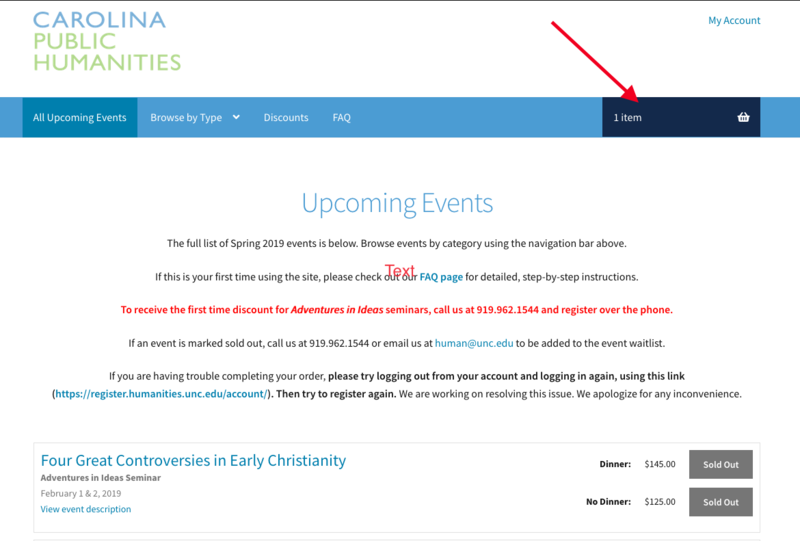 Click “view” order to see what specific events you’ve registered for. 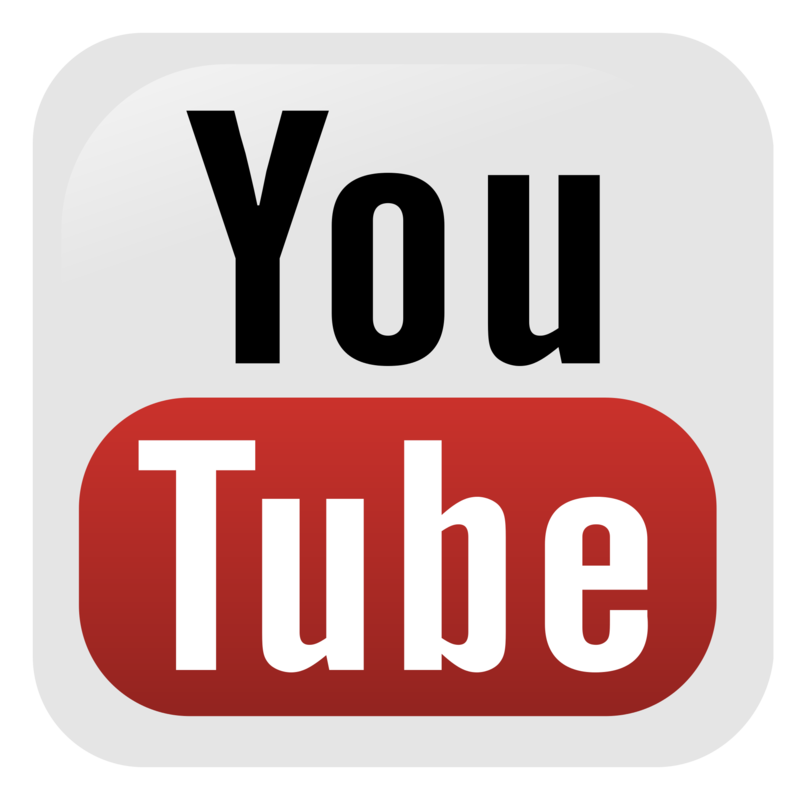 If you have any trouble, please call us at 919.962.1544.